The member of the House of Representatives for Vandeikya/Konshisha Federal Constituency of Benue State, Rt. Hon. Mrs Dorothy Mato has reaffirmed her commitment to the All Progressives Congress (APC). 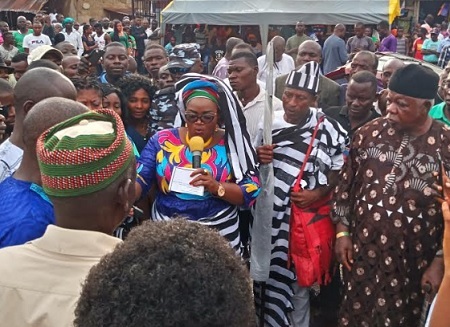 Speaking at the occasion organized in her honour by Mbatyough elders in Tsar, Mbaduku Vandeikya LGA of Benue State on Friday, September 7th, 2018, Hon Mato said when some politicians were defecting from APC to PDP and other parties, some people asked her why she didn't defect to PDP. In her response, she made them to understand that someone who builds a house and is committed to making it conducive will not allow a visitor to destroy it and will not leave the house they have sacrificed a lot to build to go elsewhere. She stated that she remains in APC and will not leave the party they have suffered to build to any other party and calls for her supporters never to be discouraged by the prevailing circumstances and keep faith with her and the party for things to be appropriately repositioned. Rep Mato is one of those who sacrificed a lot in the then Action Congress of Nigeria (ACN) for the Successes the party attained in Vandeikya and Benue State at large before it merged with other parties to form APC. Hon Mato in 2010 accepted the call by a fusion of political associations to contest the Benue State House of Assembly for Kyan Constituency which she won by popular votes under the then ACN on April 26, 2011. On the issue of herdsmen attacks in Benue State, Mrs Mato stated that the killings have also been politicized to make things look worse. She said that since the arrest of Aliyu Tashaku ( a Boko Haram kingpin) who masterminded most of the attacks in Benue, the attacks in Benue State has never been worse since then. Rep Mato has spent less than one year at the National Assembly since she was sworn-in on October 3, 2017, yet she has done a lot for her constituency. She appeals to the good and transparent people of Vandeikya/Konshisha to continue to give her their unswerving support so that she will be voted in 2019 for the desired impact to me made more significantly.